Doesn’t matter what kind of business you work for! All businesses around the word use Internet connectivity as communal technology to communicate between them. Chose the right Internet connectivity is not easy because if you choose the wrong one, this can be extremely frustrating and also can reduce your business productivity causing delays and cost. Nexus IP provide a free Pre-Sales consultation to understand your business needs. From our experience, most of the connectivity options we offer, comes with care level 4 support*. ADSL (Asymmetric Digital Subscriber Line) delivered over an analogue phone line and is an entry-level business Broadband. It is ideally used in small businesses where Internet use is low and there are no heavy bandwidth requirements or as a backup to a fibre service in larger offices. Fibre optic broadband comes in two variants, fibre-to-the-cabinet (FTTC) and fibre-to-the-premises (FTTP). Both variants replace at least part of the copper wire found in an ADSL line with fibre optic cables with speeds of up to 80Mbps depending on your location. Ethernet in the first mile (EFM) uses the Ethernet protocol to carry the Internet over standard copper wires. EFM, with speeds up to 35Mbps, is a low cost alternative for a Leased line. It is ideal for organisations that regularly share large volumes of data or applications between remote sites. 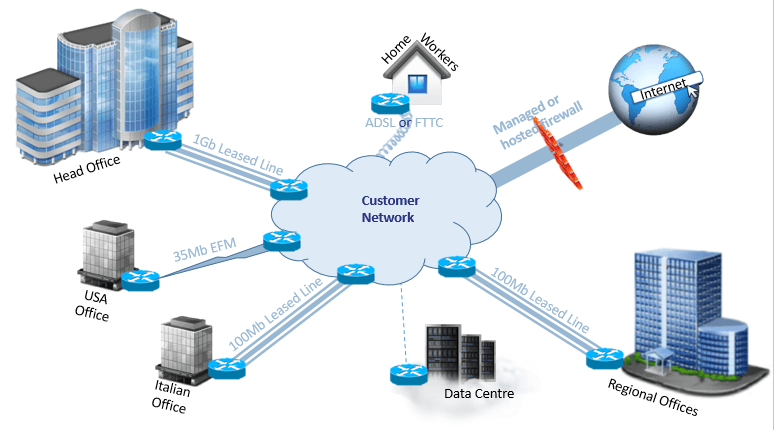 A leased line is a dedicated high performance network connection between provider and customer. Available over ADSL, ethernet of fibre, leased lines are not subject to cabling. Leased Lines, with speeds up to 10Gbps, is recommend for businesses with more than 50 employees, or those who have high upload and download requirements, leased lines allow businesses to make use of the latest Internet capabilities. MPLS is a Wide Area Networking service that offers a reliable and cost effective way to connect your office locations, remote and mobile workers on one secure private network wherever they are located. The service runs over a secure global backbone and utilises the universal language of Internet Protocol (IP) and so supports the transport of data, voice, and video traffic across a single network. MPLS is also highly scalable and future-proofed, enabling your solution to be easily adapted to meet changing business requirements. * Leased Line Ethernet - 6 hour fix, starting from fault acceptance by the carrier. *Hosted Telephony - 4 hour response, acknowledged by a unique ticket reference supplied by our Helpdesk.